The Staub Cast Iron 4 1/2 qt. Perfect Pan is shaped very much like a wok, but is versatile enough for braising and sauteing. With a slightly flattened center bottom, the pan will sit flat while stir-frying or easily slide in the oven for a casserole. 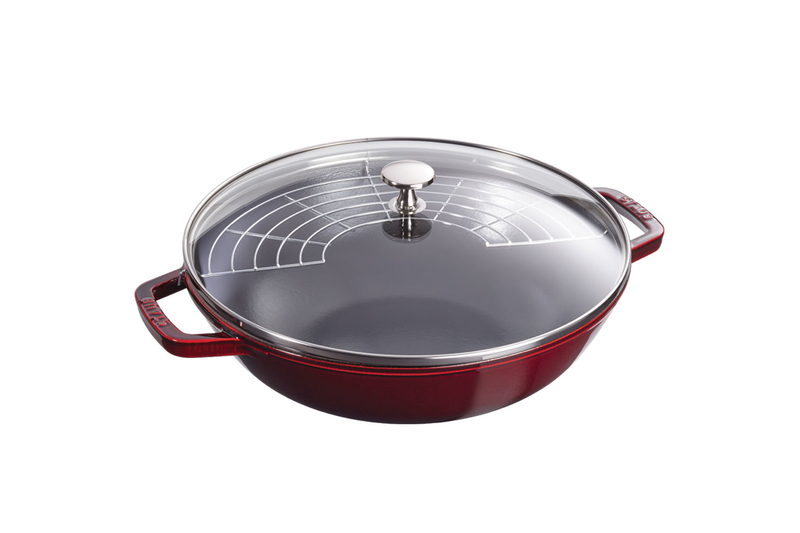 This beautiful pan is made in France in Staub's range of enamel colors, like this Grenadine, and is oven safe to 500° F.
The Staub Perfect Pan will be perfectly a part of your kitchen. Use for stir-frying, braising, sauteing and baking. Flat center bottom for ease of use on the stove top. Enameled cast iron construction heats evenly and retains heat. Beautiful service piece at the table that keeps food hot until the meal is served. Generous 4 1/2 quart capacity allows plenty of room to toss and stir without spilling over the edge. Includes glass lid, stainless steel half moon grid, wooden spatula and chop sticks. Made in France in a glistening Grenadine color. Resistant to rust, chipping and cracking, the coating requires no additional seasoning like some other cast-iron pieces. Compatible with all cooktops, including induction. Lifetime warranty from Staub with normal use and proper care. Ideal for use on any cooktop, including induction. For best results, use low to medium heat on cooktop. Gently pre-heat your Staub cookware on a low setting for 2 to 3 minutes then add oil or liquid to the pan. Use wood, plastic or heat-resistant nylon tools to avoid scratching the enamel surface. Do not slide pan on stove top. Enamel can chip or crack if dropped or banged on hard surface. Allow to cool before washing. Avoid using steel wool, steel scouring pads, harsh detergents or abrasive cleansers. Stubborn food residue and stains can be removed with a nylon scrubbing pad or sponge. Select low to medium heat for best results. Select the size of your heat source so that it is as close as possible to the base size of your pan. This will prevent energy loss and overheating of the handle. Gently pre-heat pan on low setting for 2 to 3 minutes then add oil or liquid to the pan. Use only wooden, plastic, or heat resistant nylon tools, to avoid scratching the enamel. Use a potholder or oven glove to lift metal handled pans from the stovetop or oven. Stand hot pans on a trivet, board or cloth, not directly on unprotected counter tops. Cool pans before washing in hot soapy water, rinse and dry thoroughly. Remove stubborn food residues with a plastic or sponge scourer only - do not use metal scouring pads or abrasive cleaners of any kind.